Stay away from Mill Road! said Local Secrets readers who responded to our call for comments on the proposed Tesco on Mill Road. Most praised the diversity of Mill Road, noted the high number of Tesco branches already in Cambridge and warned of damage to such a well-loved place. “It will be completely out of keeping with the present atmosphere of lovely small local shops”, said respondent. “When I was a lad Mill Road was Diagon Alley to my dad”, said another. Just like the hidden street for wizards in the Harry Potter books, Mill Road was talked of as magical, worth preserving and something firmly better off without one more chain store. But not everyone had scorn to pour on chains. “I would love to see Woolworths opening… I have to keep travelling to Newmarket to shop in their branch”. 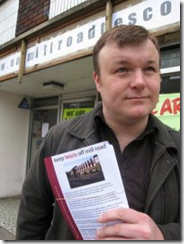 When word got out recently that Tesco were applying for planning permission to support the opening of a new express store on the former Wilco site on Mill Road, a grass roots campaign was launched in opposition. ‘Say No to Mill Road Tesco Campaign’ spokesman Richard Rippon said the action awakened “the sense of community… Tesco showed us what is here”. The campaign has focused on concerns about anti-competitive practices, the increased volume of traffic another store would bring and the threat a chain store brings to Cambridge’s most diverse shopping thoroughfare. “Mill Road is something worth preserving for the whole of Cambridge” added Rippon. Campaigners have spearheaded a petition to the City Council with over 4,000 names along with 800 objections by email and more by post. An extraordinary meeting by the planning department scheduled to for the end of November will deal with the large number of objections. Local politicians across the parties have also shown keenness to be have a say, including Cambridge MP David Howarth, and leader of the council Ian Nimmo-Smith who has just referred Tesco to the Office of Fair Trading. Retail giant Tesco already has three regular supermarkets in the city and four smaller express-style stores. As Tesco Corporate Affairs manager Michael Kissman told Local Secrets, over 90% of the urban UK has a choice of three supermarkets within a 15 minute drive, “Why would one more be a problem?” The proposed Mill Road Tesco is in the final stage of planning, with current applications pending for minor alterations to existing pre-approval. Kissman said the store would bring 20 full and part time jobs to the area and most customers would visit on foot. A meeting is currently being scheduled between the campaigners and Tesco representatives. SUPERMARKET giant Tesco has said it wants to hear from people living in Cambridge’s Mill Road area about what they think of the company’s plans to open up there.Tesco is planning to meet residents, councillors and David Howarth, MP for Cambridge, right, to talk about its plans and said it wants to hear feedback directly from local people. A spokesman said the company felt some people had “misunderstood the scale of our plans”. More than 4,000 people have now signed a petition against plans to open a Tesco Express store in Mill Road. Coun Ian Nimmo-Smith, leader of Cambridge City Council, has even written to the Office of Fair Trading asking for the competition commission to investigate the supermarket’s operations in the city. Tesco has submitted a planning application for new signage, a cash machine and an extension at the back of the former Wilco premises. Representatives of the company have met with planning officers to discuss the application. A company spokesman said: “It was useful for us to hear the feedback of local people. Some groups appear to have misunderstood the scale of our plans. We are proposing a small convenience store that will actually be smaller than the Co-op currently on Mill Road. “We were able to explain that most customers will come to the store on foot or bike and not by car. We also explained that the deliveries would be handled by small vehicles appropriate to the streets of Cambridge. Anyone expecting 40ft articulated trucks need not worry. Mr Howarth said there were still concerns about Tesco’s delivery policy and confirmed he would be meeting the company. Sonia Cooter, co-ordinator of the No Mill Road Tesco Campaign, said: “It is clear that Tesco has underestimated the strength of public feeling against their plan to open a store on Mill Road. “Any attempt to consult with the community at this late stage in the planning process seems rather patronising. We think the opinions of the people who live, work and shop on Mill Road are more important than that.